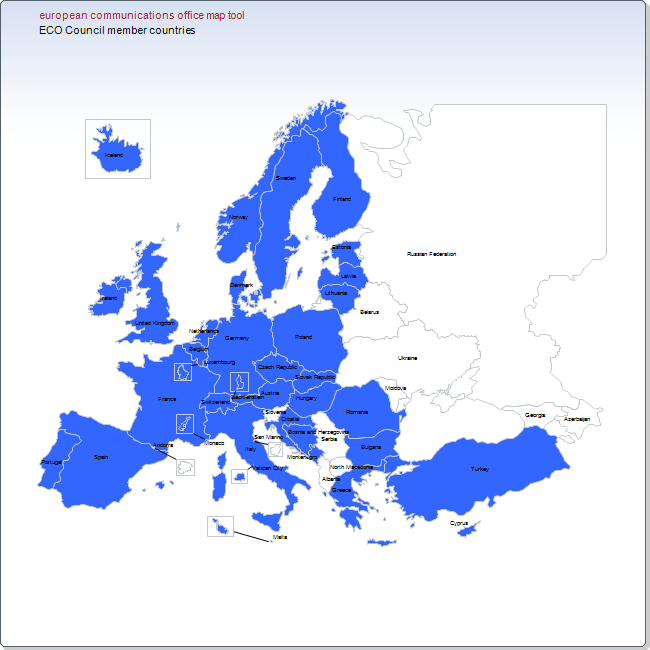 The European Communications Office (ECO) is the permanent Secretariat of the European Conference of Postal and Telecommunications Administrations (CEPT), an organisation where policy makers and regulators from 48 countries across Europe collaborate to harmonise telecommunication, radio spectrum and postal regulations. The ECO is governed by a Council, consisting of representatives of the 36 countries contributing to the financing of the ECO. The countries are listed at the bottom of this page and shown on the map. enter into contracts and agreements on behalf of the ECO. At the 19th meeting of the ECO Council in Copenhagen on 21-22 November 2018, Malta became the 36th member of the ECO Council. The ECO Council appointed Dr. Samuel Ritchie of Ireland for a second term as ECO Council Vice-Chairman. It also approved the 2019 ECO budget and the 2019 ECO work programme. The ECO Council appointed its Chairperson for a second term as ECO Council Chairperson. It also approved the 2017 ECO Annual Accounts and took note of the publication of the 2017 ECO Annual Report. The ECO Council approved the 2016 ECO Annual Accounts and the 2016 ECO Annual Report. The ECO Council approved the 2017 ECO budget and the 2017 ECO work programme. The following countries participate in the ECO Council: Austria, Belgium, Bosnia and Herzegovina, Bulgaria, Croatia, Cyprus, Czech Republic, Denmark, Estonia, Finland, France, Germany, Greece, Hungary, Iceland, Ireland, Italy, Latvia, Liechtenstein, Lithuania, Luxembourg, Malta, Monaco, Montenegro, the Netherlands, Norway, Poland, Portugal, Romania, Slovak Republic, Spain, Sweden, Switzerland, Turkey, the United Kingdom and Vatican City.